Chris Walsh from MJBizCon states the booming cannabis industry offers a bullish market to invest. The CA recreational market share has the potential to reach $4.5-$5 Billion. This will equal the industry of the whole country. Twenty-nine states have legalized medicinal marijuana, seven states have legalized recreational use. Since 1990, when the human endocannabinoid system was discovered by Raphael Mechoulam in Israel, the acceptance of marijuana as a medicinal herb has continued to spiral upwards. While the politicians prohibited research in the US, our own National Institutes of Health has been sending millions of dollars to support Mechoulam’s research for over three decades. Users across the globe are the catalyst for the scientific community. In 1990 the support for legalizing was a mere 23%. In 2010 support for legalization was between 28-54%. In 2017 64% of the American people support legalization; 72% are Democrats, 61% are Independents, and 51% are Republicans. While growth is exploding in cultivating, distributing, and sales, the industry continues to have risks due to the federal prohibition. 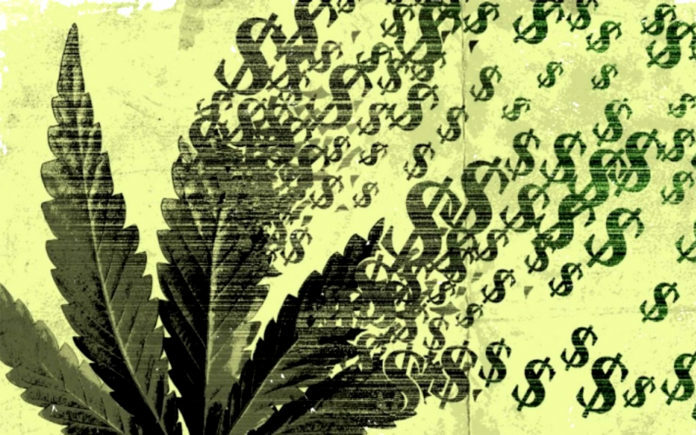 Until the federal government reclassifies marijuana, to lift banking access, the black market will exist. State legalization sets up confusion, and delays in granting licenses. The patch work of onerous bureaucratic regulations along with state, county, and city taxes, force users to gravitate to the cheapest product. In 2018 look for consolidation and possibly one major cannabis leader to implode. Before recreational legalization in CA, an ounce of weed was $200. The taxes increased the cost to $370. The black market now knows it can charge just under the taxed price at $270. The tax structure is an alluring golden egg for politicians. To compete states eventually will see their greedy taxes drive dollars underground. Which state will be the first one to treat cannabis like tax free Tylenol, or Digoxin? Education by scientist, medical physicians, and users is removing marijuana/cannabis out of the addiction, death rendering, myth based realm. The Journal of Cannabinoid Research, produced by the International Cannabinoid Research Society, (ICRS), is a non-political, non-religious organization dedicated to scientific research in all fields of the cannabinoids, ranging from biochemical, chemical and physiological studies of the endogenous cannabinoid system to studies of the abuse potential of recreational cannabis. The opportunities for investment are endless. Cultivators are marketing their products as 100% natural and certified by the Global Food Safety Initiative (GFSI), an industry driven global collaborative platform to advance food safety. Brands like blum, IVXX, terra tech’s Edible Gardens are investment opportunities in cultivation. OWC Pharmaceutical Research Corporation [OWC Pharma](OTCQB: OWCP) will be the sponsor at the 2018 Wall St Conference. OWC is an Israeli pharmaceutical penny stock. The projections for growth are expected to hit 8.5-11.6 billion dollars in 2019. There is uncertainty on where the medicinal side of the industry will be. Per Viridian Capital Advisors, the global investments have doubled over a year ago. Agricultural investments up eightfold, cultivation/retail has tripled to hit $718M, infused and software has more than doubled. In 2011 investments were $100,000. Now the norm is ten million. In Canada the firms are managing hundreds of millions as they export around the world. In 2018 a fund will raise $250M and $150M. 2018 will see the raise of the chains expanding into other states. Outside industries will invest. Scott Miracle Grow is investing half a billion in the cultivation. Netflix is marketing their brand by partnering with a dispensary in CA. They developed a specific cannabis strain for the program. The agriculture industry will drive the growth of hemp to satisfy the demand for CBD. Chris Walsh from MJBizCon predicts Trump will make an overt move to relax current regulation. What’s in your portfolio 2018? Next articleHow Does Divorce Affect Social Security?